I've been waiting to post on my homemade toner until I made sure it was good enough for actual use^^ I've been using it for a month now and it's made my skin much happier. I ditched my old toner and am sticking with this one. 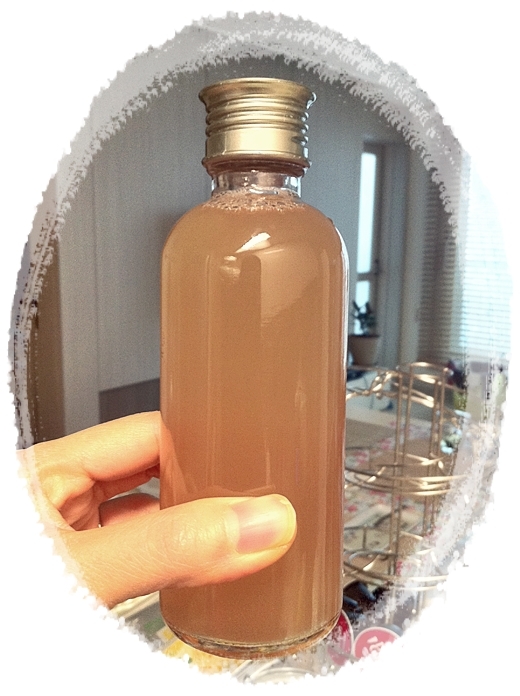 1 TB of rose vinegar (homemade - I got "rose tea" and seeped it with vinegar for a week). That's all of the ingredients. You can mix and add them into a clean glass bottle. I washed and reused an old glass bottle. You can more or less vinegar depending on your skin sensitivity. If you're not too sure how much vinegar you can handle, you can experiment with making a trial toner with distilled water & 1 tsp~(more or less). You can mix however you want to make sure its right for your skin. I add enough vinegar so it doesn't sting and smell like one. I'm glad I'm finally getting the hang of this slowly. I am enjoying not needing to feel "slaved" to believe a "new-it" cosmetic item to save my skin. If feels like a huge relief.. I can't wait to experiment with more.